Shizuoka. Free parking for 300cars. sales negotiations, meetings and exhibitions. 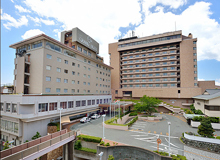 The City Hotel represents Hamamatsu city, Shizuoka. Free parking for 300 cars. Our hotel is the only "full service hotel"
for business trip, sales negotiations, meetings and exhibitions. A free shuttle bus is available on weekdays. © 2019 Grand Hotel Hamamatsu All rights reserved.